Looking at the sum of its parts, The Lord of the Rings is probably the best trilogy ever made. As a friend pointed out, most “trilogies” are in fact series that followed a successful first movie. Only The Lord of the Rings was conceived as a trilogy from the beginning. I will not be disappointed if The Return of the King wins Best Picture or if Peter Jackson wins Best Director at this year’s Oscars. Although the award will ostensibly be for The Return of the King, statuettes would actually be well-deserved rewards for seven years of hard work on three epic films by one talented nerd and his crew. Viggo Mortensen was not Jackson's first choice for Aragorn, but his first actor was too young for the part. In spite of all the CG armies, over 20,000 extras were cast in the three movies. 15,000 costumes were made by the wardrobe department. The 9 members of the fellowship had an elvish "9" tattooed after the shoot. As in Tolkien’s books, several threads weave through Return of the King. It opens on a flashback to Smeagol (Andy Serkis) as a normal-looking hobbit-type creature, fishing with a friend when the friend finds a golden ring. Smeagol quickly becomes jealous of his friend’s interest in the ring, and kills him. A series of shots shows Smeagol’s corruption into the thing that is now called Gollum. 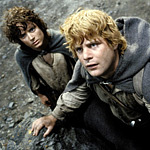 Now, Gollum, Frodo (Elijah Wood), and Sam (Sean Astin) have made it to the outskirts of Mordor. They need to find their way in to Mount Doom, where they can destroy the ring. Gollum turns Frodo against Sam, and they separate. Alone with his “master,” Gollum leads Frodo into Shelob’s lair where he expects the spider will devour the hobbit and spit out the ring. Frightened but ever courageous, Sam resolves to help Frodo, whatever happens. Gandalf (Ian McKellen) and Pippin (Billy Boyd) find themselves in the city of Minas Tirith. The steward-king Denethor (John Noble) has gone mad with grief over the loss of his favorite son Boromir (who died at the end of Fellowship). The city is about to be besieged by armies of Mordor, so Gandalf takes control from the useless Denethor. Aragorn (Viggo Mortenson) is playing politics in Rohan, trying to raise an army for the defense of Minas Tirith. Elrond (Hugo Weaving) arrives in Rohan to present Aragorn with the reforged sword of the house of Gondor. With the sword as proof of his claim to the throne, he is able to demand the loyalty of an army of ghosts, who sail with him to Minas Tirith. After the denouement, Jackson wisely gives the audience ten minutes to come down. With this time, he shows us Aragorn’s coronation (looking a lot like the last scene in Star Wars). He shows us the hobbits’ return to the shire (shortened and sanitized from the book’s scenes), and a touching, moving, final farewell that nicely caps three years and ten hours of some of the best moviemaking ever. But not all of the characters get their due. Aragorn, who is the title character after all, doesn’t get as much screen time as I had hoped. Legolas and Gimli have so little to do they are relegated to sidekick status. There are other disappointments, too. For one thing, The Return of the King isn’t as fresh as the other two. The first film introduced us to Jackson’s vision. The second film introduced us to Gollum and the Ents. The third film does introduce some new creatures — oliphants and the flying Nazgul — but these are background filler, not foreground characters. For another, there is something unsatisfying about watching a screenful of film where almost nothing was actually photographed. The scenes of giant oliphants stomping the swarming human soldiers look like a video game. And when Legolas swings from the oliphant harnesses, he seems to defy the laws of physics. Computer generated (CG) graphics are a necessary evil, and Jackson uses them better than most directors, but they are often cold and disappointing. Finally, Jackson resorts to presenting the chaos of battle. In other words, rather than showing us what happens, he too often shows closeups of blurry figures from shaky cameras. Again, Jackson does it better than most directors, but he does occasionally use these cheap tricks. These are minor complaints, however, and they hardly detract from the accomplishment of Jackson and his team of thousands. The Return of the King is an astounding achievement. The visual scope of the movie is unmatched by anything but the two previous movies. In particular, the costumes (by Ngila Dickson and Richard Taylor) for all the actors and extras add an air of authenticity that makes up for the CG effects. Each soldier wears a distinctive helmet, and every horse is armored with worked leather or steel. Then there are Jackson’s low-tech but surprisingly effective tricks to make human-sized actors appear as small as hobbits or as large as white wizards. These simple effects are often the most amazing and convincing. You really believe you are looking into another reality, and not at some computer display of a video game. On its own, The Return of the King may not deserve all the Oscars it will win. But as the final chapter in a 10-hour, three-film epic, it does. Along with Best Picture and Best Director, special consideration ought to go to McKellen, who gives Gandalf a knowledge beyond what is written in the script, and Serkis, who was recognized by many groups, but not the Academy, last year for Gollum.